Writing for SEO has become an adventure, a complicated math problem we are all trying to calculate by finding the secret to get the results faster. The number of search engine factors advanced, the Google algorithm updates increased, the number of businesses that use SEO increased, the number of SEO agencies increased and more and more people became aware of its importance and the market is pretty cluttered and the competition is very high. And we know how important it is for you to stand up in the crowd. There are some things that are still available in terms of SEO, and also lots of new ones. We’ve put together a guide to find out how to write for SEO in 2019 to be above the pile. We’ve said it lots of times before, and we’ll continue to say it as long as everybody understands the importance of its meaning: content must be written for the user. Contextual content is the new icon in terms of SEO at the moment. It is one of the important changes that took place in the last period. Lots of SEO experts talk about semantic and context-based results. The first step in SEO has been the same for quite some years. We’re talking about keyword research. Deploying the topics of interest and the killer questions, we can elaborate a descriptive terminology. Keywords will help us describe the topic at its best for the users and make it optimized for search. Finding keywords shouldn’t be hard. You need to have a starting point and based on the targeted keyword you can find many derivatives. There are tools that can help you find the best examples and generate traffic. Keyword Tool and Content Assistant are two awesome helpers, that work best together. They’re like your best buddies you can call in the middle of the night to get you out of trouble. We are talking about producing content for SEO, which means valuable, evergreen and quality all-in-one. And for that, you need to raise your head up the crowd and don’t get flushed away by all the people that are “writing” and creating worthless content. There are lots of noisy environments with “too much” SEO content. Without strategy, content is just stuff, and the world has enough stuff. 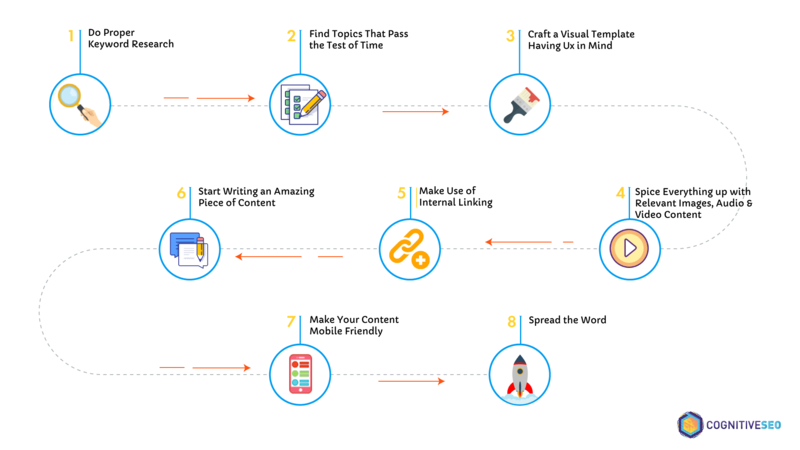 You have to become an SEO content writer, not just a simple writer for succeeding at SEO. You need to ask and answer the right questions so that your content helps the users, and keeps them on the page. Valuable content is found at the intersection between your customer’s needs and your business expertise. To get to the previous situation described above you’ll have to understand the context of your potential customers’ search and fill in the gaps. It’s mandatory to know your potential customers’ needs and interests. Google discovered that the conventional keyword search, as we know it, has some limitations and doesn’t offer topical results based on the query search. For a simple keyword, there are lots of topics related and information available online. Google developed patents to understand the context from knowledge bases for more accurate results. It wants to focus more on topic-related results so the whole process works based on probabilities. For example, when a user performs a search on Google, the search engine uses a system to return landing pages with topics related to the query by looking at the text on that page. You may ask how you can you take advantage of that and get ideas for contextual keywords. Focus on the user, the user’s search intent and how to steal their heart so to convert them. Let’s take an example. You have a pastry in the US and have a new receipt of cronut. For those who don’t know, a cronut is a croissant-doughnut invented by a pastry from New York City. Since you want to tell the world about your new cronut, there are multiple ways to do so. It is very important to decide whether your content will be information or brand. If you go with the second one, then search for the keyword and see the volume and who your competitors are. If you go with the first type of content – informational, then check to see what other people are searching for. Based on our example, you can see what people from the US searched for. Most of the keywords are informational and all of them want to know and understand what cronuts are. If your target audience knows about them, then choose directly the keywords that are more relevant and descriptive such as: “cronut flavor of the month”, “cronuts with puff pastry”. Based on these two keywords you can perform other searches and first more relevant keywords. Since we’ve talked about context, then it’s very important to collect as many keywords as possible to select a topic in the second step. When we get to the onpage optimization part, you’ll need focus keywords. Don’t end up with just one keyword, look for a second keyword, similar to the first one. The second step in the research phase is finding topics that will keep drawing the audience to your website. Usually, the articles that are evergreen have information that doesn’t alter in time, and also a type of content that solves a problem that lots of people are struggling about. In the example above I was talking about cronuts. For some, it might be an old story, but for others a new discovery. It is more unique than other types of deserts, it has two things into one. That type of product/topic might be what makes it last. When it first appeared in NYE, people stood in line for this hybrid. Nobody knew how it tasted, but everybody was intrigued. So the mystery draws attention and uniqueness keeps it alive. Word of mouth was a good trigger. The lesson here is that you need a topic that will engage the community. You can create a receipt with steps and tips because according to the research (performed in the first step) there were lots of people who want to find out how to make a cronut. The basic receipt won’t change, but there will be variations to it. So people will go to basic before trying something new for the first time. I got my inspiration after I read an interesting blog post on the furniture store Furniture of Dalton’s blog, intitled Sofa Story: A Brief History of Ten Iconic Forms. And after reading through it, I thought that article might be a very good example of how content used to evolve. And the Sofa Story can be correlated to content evolution, with a more visual effect. In the early days, sofas were hard, harsh supports made out of stone, wood, steel and lots of other material without any cushion. Over time, they gained popularity, and some types of sofas started to become a little too tawdry, with lots of cushions until they made their way to a more contemporary soft seating in a range of styles. If we were to compare it to content, it pretty easy to see the similarities; content started small, then there was the stuffed keywords era, and afterward it got more complex and more accurate. You’ll have to spy on your competition and see what their focus is to outrank them. Competition might be very high on some niches. Content Assistant is here to guide you. For a specific query, the ones that we’ve discovered above we can see the type of query we pursue – brand, informational, and commercial. In our example, we have an informational query. Looking at the competitors we can see what SEO pages are ranking. Skimming through the first 10 pages we find lots of cooking blogs, a video tutorial for a magazine (that ranks twice – once with the video from youtube, and secondly with the article published on site). In this case, we see what our competitors are, and get inspired by them. Since your a business, you can write your pieces of content using more unconventional methods. Remember how important visuals are in this industry, but we’ll talk more about this in the third and fourth step. Numbered, highlighted or bulleted steps make the recipe appear simpler and easier to make. Glazing you over the competitors will lead into the next step – the final one from the research phase. Once we’ve collected your focus keywords and the words and phrases recommended by the tool for your SEO article, you can make a list. A simple document is enough. My method is pretty simple and you can use it. First, I write a topic or title (that will be modified when I finish the article). Then, I add my focus keywords. I have a section named ideas or a structure of the article, where I add using bullets all sorts of information that I want to discuss. Here you’ll add all the ideas that you have and that you’ve discovered by looking at your competitors because our goal is to create the best piece of content there is out there. Use quotes with the source attached, save URLs, images and more. Conclusion / final note – left in blank. This will be added only after I finish the article and I can sum up a final idea based on my findings. Now you can start working on visualizing the template for your article. Would you follow a basic look or try to make it more attractive? Every article that you write needs to have a template, a natural flow. If we go further with our example, the web content needs clean visuals – images, videos, gifs, and a very important step is to create a cover photo that approaches and has the title written on it. It is easier to share it on Facebook, Pinterest and more. If you can, create a longer picture – similar to an infographic picturing the final look of the desert, if we follow our example, and then the ingredients and steps you have to perform. The way you structure your article is synced with the design of the website. That means the design of your website can make it easier or not to perform some magic tricks with your content. If you’re using an open-source content management system and not a customizable HTML website, then it is easier to implement a layout. The way information is displayed has high importance. For a receipt, you need to have a first section with ingredients that need to be separated from the main body of the article. And visuals have a higher significance. Below you can see a good example you could inspire from. The trick of this page is that Print button which makes it easier for people to have it in physical format. Somebody really knows the audience and their behavior. When you cook, you make a lot of mess and a printed format of the receipt is a very good way to make the content more useful. Lindsay, the blogger of this website, got an extra point for this little feature because her content breaks the virtual space. UX is well applied on this receipt page. UX – the holy light that brightens the page and triggers the appreciation of the user. Depending on the type of content there are some things you shouldn’t miss in order to keep the user and don’t scare them. Besides site speed and optimized images, you should also have sharing buttons (if possible for images have the Pin icon – if visuals have high importance, like in our example for pastries, deserts, and everything related to cooking, in general). There’s an explanatory image of what UX means, created by Stephen P. Anderson, an internationally recognized speaker. UX means also to know your user and their behavior so you can anticipate and give more freedom to use and read your content. Just like the example above, the print button is a great integration for receipt pages. After we’ve got you these preparation steps for gathering all the information and SEO tips that you need to make a great piece, you’ll have to put to work your writing style and skills. Here you put your magic into action. The content creation process begins. Beside the natural language and creative abilities, there are some SEO technicalities that are almost mandatory for success. Writing SEO friendly blog posts can be difficult and time-consuming. However, it’s time well spent, as SEO helps us rank better in the search engines. Correct grammar, descriptive topic where you reach all the points related, personal opinions, real conclusion and unique content are necessary for creating highly readable web pages. You need to have a relevant, engaging and attractive title to make the user click on it and stay on page. Also don’t make a promise from the title that you can’t fulfill in the body content. There might be cases when Google will rewrite your title tag with information from meta description and page content if Google doesn’t like the one you added. Chances are this won’t be as good as the one you’ve created, so you must ensure that your own title tag is completely relevant, descriptive, has the right length and the focus keyword phrases included. Create actionable titles, asking to the user’s question: What’s in it for me? Use the brand leverage. For well-known brands it is in their best interest to use the brand name in the title. The body tag shouldn’t miss. You need to highlight that part and explain to the search engines where’s the main part of your content. Where other tags are incorporated, such as heading tags (H1, H2, H3, ..H6), image alt descriptions. There are some other HTMLs that you should integrate for a better optimization: URLs and meta description. Video content can boost your content and increase your conversion rates. If we follow our previous example regarding cronuts, for the query “cronuts with puff pastry,” we have a website that ranks first with the video and then with a webpage where the video was embedded. If you take a look at the print screen below you can see it ranks in Google both on the second and twelve positions. In this case, the video tutorial can push the webpage higher in rankings. Visual content appeals to emotion, creates intimacy and engages the visitors. If you decide to add video content to your webpage, my recommendation would be to use Youtube, Dailymotion, Vimeo to upload the video and then embed it into your page. This way, you’ll have it on two supports that can bring twice as much visitors. it helps search engines understand your content. it helps the users stay longer on the website and navigate to the topics of interest. The best way to use internal links is when you are writing about something and want to bring extra explanations, and link to a page where you’ve previously talked about that. For example, now as I am explaining the internal linking power, I’ve linked to a page where we previously tackled the topic more in depth. A bad internal linking is a sign of bad architecture and you might risk misleading and confusing the user. Make sure you point to valuable, live and accurate pages and link to the proper anchor texts. The process isn’t so hard. You should know the website pretty well, or at least search to find the proper article. And the more internal links you have, the more value Google will give it. You all know the saying “Too much of anything isn’t good for anyone”, which applies in this situation also. Make sure you don’t overuse the method because too many links will drop the value on the page. There’s a limitation of 10-15 links for every 1,000 words written. It wasn’t long ago when Google rolled out the Mobile-first index. At that moment things took a different turn. Basically, Google might show different search engine results on desktop compared to mobile. Now, Google’s system for crawling, indexing, and ranking for the desktop version of the website is different than Google’s system for those processes on mobile. If, in the old days you could have content about dental cleaning on desktop and content about a completely different topic on mobile on the same website, now that’s not possible. Website are bound to make the shift to a more mobile-focused index. Google mobile-first indexing is about how we gather content, not about how content is ranked. Content gathered by mobile-first indexing has no ranking advantage over mobile content that’s not yet gathered this way or desktop content. Moreover, if you only have desktop content, you will continue to be represented in our index. Mobile accounts for half of all global web pages served and we are on an ascending evolution regarding mobiles searches. According to Statista, in 2018, 52.2 percent of all website traffic worldwide was generated through mobile phones, up from 50.3 percent in the previous year. Even if the mobile searches have experienced a continuous growth that doesn’t mean the desktop search decreased, but rather more people are using multiples devices to different actions and want to be always informed. Moreover, as of February 2017, mobile accounts for 65.1 percent of all web traffic in Asia and for 59.5 percent of all web traffic in Africa. Content amplification is a powerful method to reach a wider audience and multiply your links by hundreds. Amplifying your content should be mandatory if you want people to know about it and increase your website traffic. After you finish writing your article, the process shouldn’t stop. You have to create awareness around it and push it to other people who might be interested. We are not talking about traditional social media marketing or emailing. That’s not amplification. You can look at the amplification process as a way to strengthen the signals of your post. Writing for search engine optimization purposes can be difficult and can become a hardhanded job. You can save any limping piece of content you might have with the strategies explained above. Every action well-invested will bring you results. We’ve tested multiple times the best practices and the most efficient ways to get your results by doing the right thing and not waste your time testing yourself. We’ve compressed our guideline by talking about the crucial elements that cannot miss from your SEO content writing process in 2019. The SEO friendly content pillars are contextuality, mobile friendliness, HTML tags, evergreen roots, user experience principles and video correlation. This article is one of the best article I have read on this topic. Keep writing such fresh content. Thank you so much for the appreciation. If you have other topic ideas in mind and what us to tackle let me know.